The Seven Cycles Evergreen is the embodiment of versatility. Essentially, the Evergreen is a disc brake bike with drop handlebars and clearance for 40c tires on 700c wheels or ~50mm tires on 650B wheels. A typical Evergreen has a bottom bracket lower than a traditional cyclocross race bike for greater stability, and is designed for long-riding comfort on rough surfaces as well as nimbleness and ease in mixed terrain settings. Evergreens make great road bikes, they also are found on rough, challenging single track. The Evergreen evolved out of the desire to do more and to take on new terrain. Well-suited for gravel roads, dirt single track, and long days in the saddle, it is a true adventure machine. Seven officially introduced the Evergreen in 2013; it is now one of the most popular options for Ride Studio Cafe clients because it allows them to do so much with a single bike. When creating a custom frame, the performance designers at Seven take into account what a rider will do with his or her new bike. The rider's various desires and cycling disciplines are only one part of what helps to determine the bike's ride characteristics and qualities. But with a Seven, the bike influences the rider just as much the rider shapes the bike. A Seven will inspire its rider to take on new challenges one never thought possible. Owning an Evergreen is a provocation for adventure. Henry v. is a long-time rider at the Studio who has achieved a great deal with his riding. We remember the day he walked in and told us, "I want to become a cyclist." This was a pivotal moment. Henry grew with us as a rider and became a member of the Ride Studio Alliance. He now regularly leads our group rides as a Super Domestique. His crowning achievement was participating in the 2015 edition of Paris-Brest-Paris, a 1200km randonnee. Henry was one of our first clients to purchase an Evergreen when they were initially offered by Seven. At that time, many features now considered commonplace, such as disc brakes and a tapered head tube, were new to the cycling industry. Henry was primarily looking for a bike that would be used for randonneuring. The Studio's process of working with riders to create bikes that anticipate their future needs, however, landed Henry a bicycle that could do so much more. Four years later, we sat down with Henry to talk about his experiences and how his Evergreen has shaped him as a rider. Cal: Henry, what led you to the Studio? Henry: Originally, coffee. I live near Lexington center and my wife and I would walk to the library and after enjoy a nice coffee and admire the beautiful bikes at RSC. I had never ridden a road bike, and Patria asked me if I wanted to try one out.The first time I rode one it was like flying; it was so easy--so smooth compared to the city bikes I had been riding. I was hooked on cycling. Cal: What inspired you to become a randonneur? Did you know immediately that was what you wanted to do? Henry: It started slowly. In the fall of 2011, I was doing rides by myself. At some point, I starting doing the KIT rides. That was a real eye-opener in terms of pushing myself and going farther. We went to Harvard every Saturday and that was definitely faster and pushed my limits. That was also the first year of the Festive 500 Challenge. The day after Christmas I did a Studio ride with Pamela and John to Mount Wachussett. It was a very cold day and I had never ridden with them before. The farthest I had ridden up to that point was maybe 50 miles, and that ride was 85 miles! Then I learned about the New England Randonneurs. The first year I did a 100km, 200km and 300km. The 300km was very memorable because it rained the whole time. I was still using my Scott road bike, which was definitely uncomfortable. The Evergreen is undaunted by riding in the snow on Overland Basecamp's Wintertide Ride. Cal: What is it that you like about randonneuring? Henry: Brevets are a combination of challenge, adventure and opportunity to ride in new areas and meet new fellow cyclists. It also turns out to be a good way to test your willpower, creativity, grit and get in (or sometimes out of) tune with your body. Cal: When did you decide to buy a Seven? Henry: A half year into cycling, I knew I wanted to buy a Seven. I did not feel my current bike would be a good bike to do PBP. Ride Studio has a close partnership with Seven. It was built locally here in Watertown; they are custom tailored; I know a number of folks that work for Seven, and it was the beauty of the bike that made me go into cycling in the first place. And, of course, it is a very well made, reliable, easy to ride, beautiful bike. I ordered the Evergreen in early 2014 and planned to ride PBP in 2015. I was planning to do a 1000k in the Summer of 2014 in Virginia that took me thru Shenandoah and Blue Ridge mountains. Cal: Tell me about the process of getting your bike - what inspired your choices? What was it like working with the Studio? Henry: At the time, I was starting to do more rides with dirt and gravel and my first bike could only handle 28mm tires, so I was looking for more clearance. I also wanted to do longer brevets that required installing lights, fenders, and bags in a reliable way. Other choices were the disc brakes. We had an interview discussing my requirements including a hub generator in the front wheel, extra bottle cage under the down tube, and we had a fitting session. We had some discussion on the color. I liked a certain orange on a bike that was hanging in RSC. Hence my Evergreen's nickname everOrange. When the bike was built, I saw the actual frame being welded in the Seven factory in Watertown. There were a lot choices, but RSC helped me to get through that and came up with the right options for me. Henry regularly leads a Holiday Ride Series for the Studio and logs many miles in all temperatures and conditions. Cal: Did you find it challenging to prepare for PBP? Henry: Not really – the nice thing is that the brevet series builds on top of itself. I felt really well prepared. The only thing that was challenging during the event itself was the sleep deprivation – which I had not encountered before. I think that jet lag was a factor. I barely slept the night before the start. Next time I will probably get there a week ahead of time to acclimate to the time difference and also focus on getting more sleep during the ride. I’m thinking I'll do to it again in 2019. The atmosphere was just so good last time. I’ve never seen anything like it – just so many cyclists. And the enthusiasm from the towns that you go through – people were cheering along the route. You see people sleeping in ATM booths, on the side of the road. People even put mattresses on their front lawns for riders to sleep on. Cal: How has your Seven Evergreen changed you? Henry: It has made me a better, confident rider. Long road rides, fast gravel descents, cyclocross races; my everOrange is there. 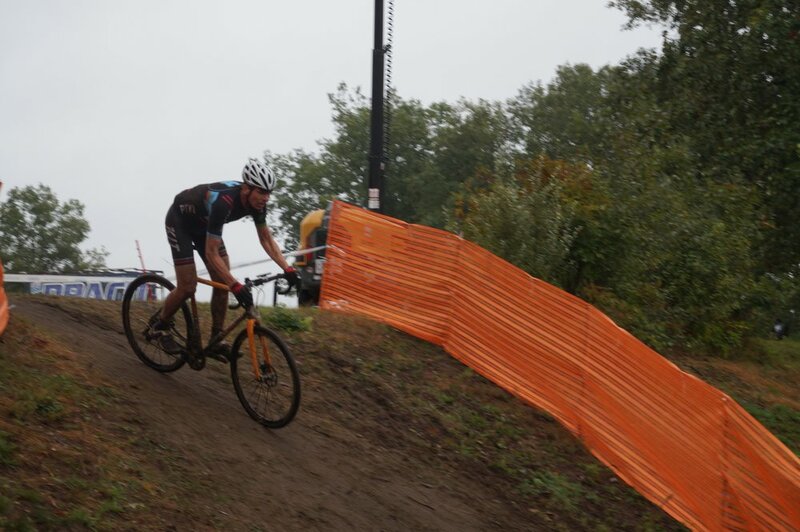 Cyclocross racing came out of mixed terrain riding. The first one I did was Orchard Cross which got me hooked. It had a great vibe – all the good things that I enjoy. My Evergreen’s disc brakes give me a lot of control. I switch my Evergreen’s gearing. For randoneeuring I have a 52x34 in the front and in the back an 11-32, which is really needed for the long climbs. For cyclocross, I’ll switch to a short cage rear derailleur and use a smaller cassette and only use my small chain ring. With a few simple changes Henry adapts his Evergreen for cyclocross racing. Cal: What do you want to do next? Future goals? Any new bikes on the horizon? Henry: This year I will do another 1000k, probably Nova Scotia this summer, next year hopefully another PBP and I am working with my friend, Beppe Salerno of Tourissimo, on a project to do gravel riding in Tuscany on the Strade Bianchi. (Check out our Italy cycling trip in partnership with Tourissimo here) Longer term, I hope to do more brevets in other parts of the US and Europe. No other bikes yet. I am not a n+1 person. I do have 3 sets of wheels for the everOrange and even more tire choices and since last year started to explore tubeless setups. That upped my cyclocross game a lot, and I also love the Barlow Pass 38c tires setup tubelessly. I have been eyeing the Fat bikes and the Seven Red Sky with electronic shifting, maybe some day…..
Cal: What in your mind is the most special thing about your Evergreen? What makes it unique? Henry: The versatility. I can use it in all these different disciplines and it still performs really well.